Usually the birth of a child is wonderful news. It signifies hope for the future, a new life, potential, looking forward! But for one of the ladies who works at Sr. Nazareth’s Workshop this was not the case recently when her baby boy died the day after being born. How sad I felt on hearing the news! I could not comprehend how the mother must be feeling. There was a huge sense of helplessness that no matter what you try to do you cannot bring the baby back. And in Haiti too many mothers have similar experiences. The infant mortality rate is high – 59 in every 1000 births – the highest in the Western Hemisphere according to Haiti’s most recent Demographic and Health Survey and maternal mortality during pregnancy and child-birth is estimated to be as high as one in 80 according to the United Nations Population Fund and partner UN agencies. These statistics give no consolation to this Jean Rabel woman or other expectant or new mothers who must endure such pain of loss. For some it just becomes another addition to all the other difficulties women in Haiti must bear day in and day out. So why in the 21st century are mortality rates here so high? Poverty of course plays the major part leading on to poor healthcare infrastructure and lack of access to healthcare. In fact, recent reports suggest that half of the 10 million + population has no access to healthcare at all. And most babies are born without the assistance of trained health personnel. 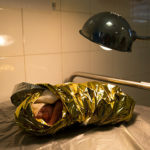 The major causes of maternal death during pregnancy and child-birth include severe bleeding, sepsis, eclampsia, obstructed labour and unsafe abortion, but in Haiti not enough woman are able to access life-saving interventions such as emergency obstetrics and neo-natal care that are available in some places. However, in the case of this Jean Rabel Workshop Lady it is difficult to pin-point what went wrong. She managed to get to the local hospital and its midwifery personnel on time. But her baby boy still died the day after birth. He was born pre-maturely and as is common practice with such babies he was placed under a lamp to keep him warm, much like that shown in the photo above. If the hospital had had an incubator for this little boy, I question whether he would still have died. Obviously, I don’t have the answer to that question, but for me coming from Ireland I feel having an incubator is simply one of the most basic and necessary neo-natal medical items every maternity unit should have in the 21st century. I would like to see the situation here in Jean Rabel’s hospital changed for the better and before too long so other mothers and babies won’t have to suffer such loss of life. So any money I might raise for the rest of my time here, I will put towards getting an incubator for the local hospital. If you agree this needs to be done please comment and share this post!